It’s a wonderful thing when you create a home environment where your children can thrive and learn to read at their own pace. I’ll always be a strong and vocal proponent for school choice because not every child learns the same way or at the same speed and traditional school systems are set up to keep pace with the middle of the pack. Children falling outside the mainstream or on the edges of the bell curve can and do get left behind, especially when it comes to reading instruction. Let me say that I applaud you for making the investment in your children’s education at home. That being said, we don’t want any child to get stuck when learning to read. Forward progress in reading is always the goal and critical to the foundation of learning to read and the love of reading. You know the famous and beloved fable from Aesop about the tortoise and the hare. It’s one of the first stories we learn as children. The moral being it’s OK to be you and progress at your own pace. It’s a reminder we all need in this fast-paced society. 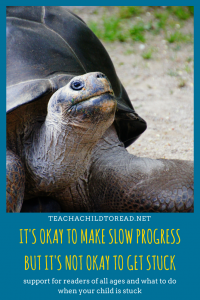 Turtles make progress – just at their own pace! It’s true, but they can also get stuck. If a turtle ends up on his back, his progress is stalled, he is likely to experience frustration, and may eventually give up. That’s not the moral we are shooting for when it comes to learning to read! If your child encounters reading books as hard, stressful, and something she is not good at, she can quickly give up and decide that reading is just not for her. 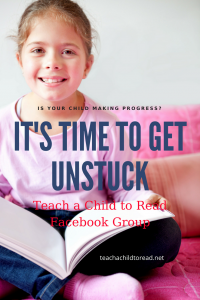 We know that reading fluency and comprehension is critical to the ability to thrive in all walks of life and to move forward in their education, so we cannot allow our children to get stuck. Sometimes it is us who are stuck. We’ve used the same materials we used with our other child, but this time it’s just not clicking. Or maybe reading came more naturally to your first child and the second one seems more resistant. It’s important to approach each child as an individual and have a toolkit of resources and strategies to use in order to be able to pivot when one strategy isn’t working. There are some basic things that ALL children need to thrive as readers and then there are some things we need to work on when the skills are not developing in specific areas. Let’s take a look at what all children need and what we can do if our child seems to be stuck in one particular area. The video below dives into each of these points in greater detail. Children need individualized Instruction to learn to read. How wonderful that you can offer this in your home. It’s truly a gift that your child would not be receiving in a large classroom setting. You can choose books and genres and other reading materials that appeal to your child thereby enhancing interest in learning to read. You can slow down or pick up the pace if your child is bored, confused, overwhelmed, or tired. You are not teaching a curriculum, you are teaching a child. You can spend more time on games and practice in areas your child needs while skipping over or fast forwarding through skills she has already mastered. You can review and repeat books or activities until mastery is obtained without the pressure to keep moving forward. Because you work with your child as an individual, you can adjust to your child’s strengths, indulging in writing books and creating artwork around the lessons and books. You can introduce informational text that capitalizes on your child’s interests and creates connected lessons to science and history and other areas of your curriculum. Children need a lot of modeling when they begin to learn to read. Scientists have recently been decoding how “mirror neurons” in our brains work. They’ve realized humans are wired to connect with others, to live vicariously through others’ experiences, in much stronger ways than we once thought. Most important for parents, these mirror neurons are also a key to how we learn. Just watching someone read a book teaches us more than we ever realized about the reading process. And we use our emotions to readily connect those experiences to other related tasks (either physically or emotionally). Mirror neurons are also the reason modeling in your home is so essential. When children see the strategies adults use to tackle difficult texts, no matter the genre, their brains don’t differentiate between their experiences and ours. The adults’ strategies become part of the mix that fires up whenever a student approaches a new text. Just by reading to your children, you are teaching them to read! Parents often are shocked when I tell them how much practice time their children need when they are first learning to read in order to become strong, active readers. They are even more shocked when I tell them how much time their child should practice if they are behind in their reading ability. But consider the idea that what we do we get better at, and what we do more, we get better at faster. The fact is that reading is an accrued skill: those who read more, generally read better. And it’s a bit of a cycle, as children who read more read better and children who read better tend to read more. This positive momentum propels them forward as confident, active, and engaged readers. But this momentum can work the opposite way as well. Children who find reading hard, boring, or have negative experiences associated with it will read less, and less engagement with text makes them weaker, passive, unengaged readers. Always keep reading enjoyable and avoid frustration or negative experiences. If reading material is too hard, drop the level down until your child is able to make progress. Reading at a frustration level always does more harm than good. This is most especially true when children are first starting to learn to read. A developing reader needs 90 minutes a day of reading practice. This includes time with you and independent reading time or reading with others. Please break this up throughout the day and allow for ample opportunities to pick up books. A child who is one or more grade levels behind in reading can need double that time. 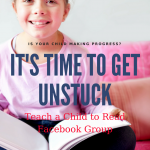 It can be hard to fit that in and convince the child who reads slowly or doesn’t like to read, so you will need to offer incentives, lots of support, start small, and work toward that goal. Remember What Children Need When Learning to Read! 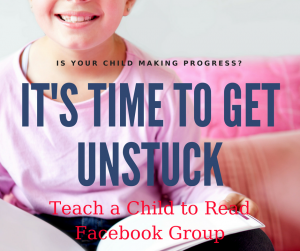 If you have specific questions about your child’s reading progress or need simple strategies to help expand your repertoire, join our Facebook Group. Really stuck? Just starting to work with your child or have concerns that s/he is not where they should be? My thrill is seeing families and children thriving in their pursuit of reading.